Don't let the title fool you. There isn't any fashion in this post. This is mostly just a way for me to a) start on one of my 'resolutions' for this year (see #1, below), b) to put this stuff out on the Internets to hopefully hold me more accountable, and c) to get a damn blog post up, since it's been almost two months since my last one. Also, this is the first year we didn't do anything for New Years Eve, and boy, was it nice. 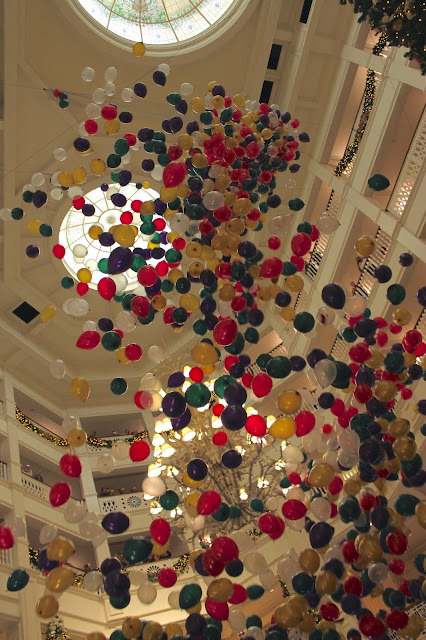 The picture above is from last year at Disney's Grand Floridian Resort and Spa. So. 2015 was amazing. AMAZING! I married my best friend, honeymooned on the Disney Fantasy, visited California twice, once for D23 and once with my hubby after Thanksgiving, adopted our new fur baby, Obi Cat, got a job at Lilly Pulitzer, then at Disney, met new friends, spent time with old friends, and just had an all-around great time. I'm not one to make New Year's Resolutions- call me a pessimist, but I think they just tend to set people up for failure, and then guilt for not living up to the 'expectations' they put on themselves. That said, I do like setting goals, and have a few things I'd like to work toward in 2016. Ok, here goes. In no particular order. 1. KEEP UP WITH THIS HERE BLOG MORE REGULARLY! I really envy/admire some of my favorite bloggers who seem to do it all- raise kids, run a household, be a devoted wife, hold down part-time jobs, AND create consistent, interesting content for their blogs. (I'm looking at you, Dixie Delights, Sweet Southern Prep, Oh Dear Drea, Cupcakes and Cashmere, and Designer Bags and Dirty Diapers.) What's the trick? What's your secret? I think I'll ease into this by committing to blogging twice a week. That seems doable. I hope. It's really motivating when I meet people who say they love my blog; extremely flattering, but baffling to me since I'm so sporadic with it. That alone makes me want to put more effort into it. If I can stick with this for six months, I'll reward myself by paying to have my blog professionally formatted and created. Yeah, that sounds good. 2. Stick with an exercise routine. I'm not looking to lose weight or anything, per se, I just want to be consistently active and tone up. Maybe an aerobic workout twice a week, and yoga once or twice? We'll see. 4. DECLUTTER! This ties in with #3, above. A friend posted this great list of 200 things to get rid of- I read through it last night and found it SUPER motivating. We're moving the end of February, so this is the perfect time to start getting rid of crap. Watch the blog for clothing sales! 5. Slow down and enjoy. I like to think I'm okay at this, but truth be told, I always feel like there's more to do. Change the sheets. Do the laundry. Clean the bathroom. Re-pot the plants. Cook the dinner. Vacuum. Make the bed. Organize the knick knacks. Do the exercise. Brush the cats. Read the blogs. Watch the vlogs. File papers. Take down/put up holiday decorations. Blog. Sweep after dinner. Wash the car. Make appointments. And on and on and on. Basically, life stuff that everyone does everyday. I'm fine with that, but I often feel guilty for not getting to something, and I need to let that go. Whew. Thanks for reading, and thank you all for being here, in this space. Hope your 2016 is blessed and beautiful. It sounds like some of our goals are similar: declutter, exercise, etc. I can't wait to read more from you in 2016! Melinda, you've made my day. No, year! Thank you so much for the kind words. Fellow Disney (and now Lilly) lovers unite! Hope you scored some good stuff during the sale. Thanks again for reading. Hopefully we can meet up around WDW some time.